Thank you for your kind attention yesterday. It wasn't simply "here's a bass and here's the bill". I appreciated the respect you afforded my young lad, as he has a very high regard of you from hearsay and the little contact he had with you. He and I were well impressed with the whole "experience". This I am pleased to observe is not uncommon among the music fraternity and professionals, but is sadly missing in most of the rest of "humanity". Thank you again, and we wish you continued great pleasure from your music, instruments and inspiring others. (he is "well-rapt" with the bass. I eventually prised him off it at 00.30 ) Chris and Fabian Martin. "Wow! 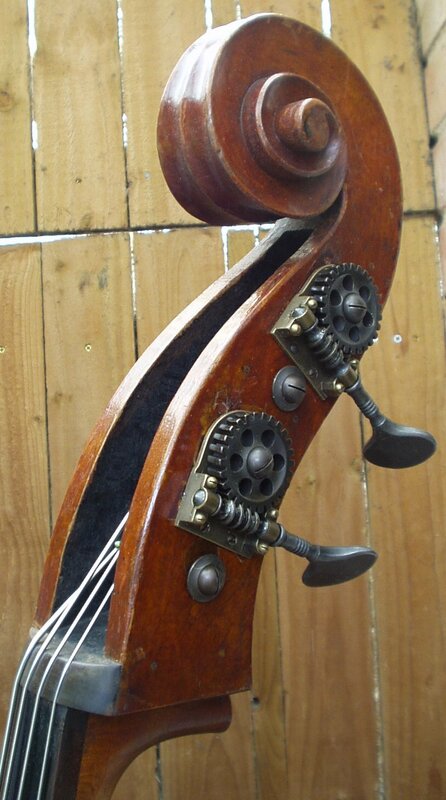 Tim, your fantastic work has transformed this bass into a full sounding and responsive instrument that is a pleasure to play. Many thanks for your skilled and sympathetic workmanship." "Hey Tim, I don't know what you've done to my bass, but it's playing like a dream!!!!!! skills and care." Andy Baker, professional bassist. We always have a good selection of student double basses - Old, new, English, German, French, Chinese, Hungarian and so on. Brand s include Hawkes, Stentor, Zeller, The Sound Post, Cellini, Graziani, Ivrogny etc . NEW !! We specialise in "awkward" necks. 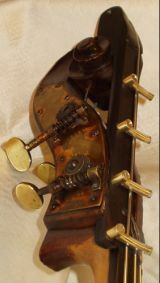 This old German bass has a very long neck which has been shortened, putting the "E" catch about an inch along the neck. 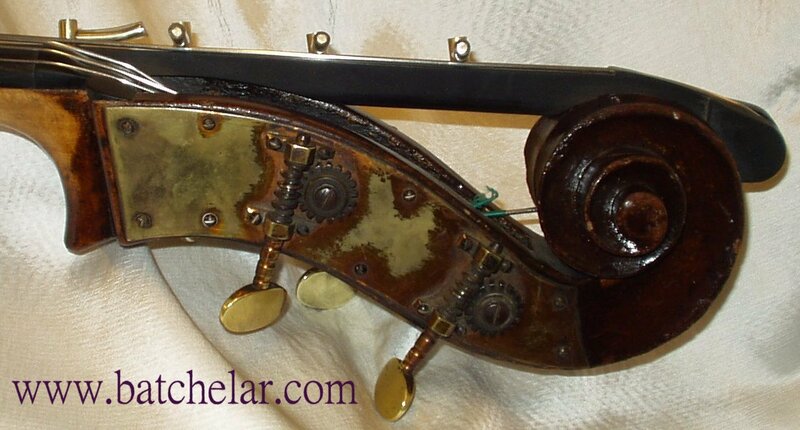 This bass has a sweet tone and a lightly figgured back in two pieces of well quartered sycamore that is very attractive. It benefits from the usual high standard of Timothy Batchelar set up including Thomastik "Bel Canto" strings, Despiau bridge, ebony tail-piece and fingerboard, and has of course been "voiced" by Timothy Batchelar personally. 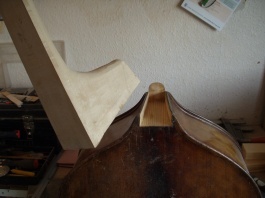 Also available in viol outline, without "violin" style corners. He's called Basil, reluctantly offered for sale by a lady who has given up playing. We generally have more instruments coming through the workshops that we have not yet put on this site - please email or telephone for details. 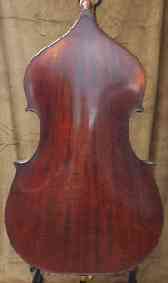 Interesting nineteenth century German flat back bass, probably mittenwald, lovely tone. Presently being restored. Hawkes "Professor" circa 1905, currently awaiting restoration.